Free home security system. Call today 800-599-8452. $99 installation fee is added.. Noted American home security systems company Elite Security Services is once again making news in the security industry. Their basic package of home protection is quickly emerging as one of the most sold security packages in the market. This basic package has a monthly rental of only $35.99 and provides trustworthy protection to home owners. It may be recalled that Elite Security Services is a rapidly expanding company that has taken the industry by storm in the last few months. The cheap home protection option provided by Elite Security Services is all set to change the market dynamics in the days to come, feels the industry experts. 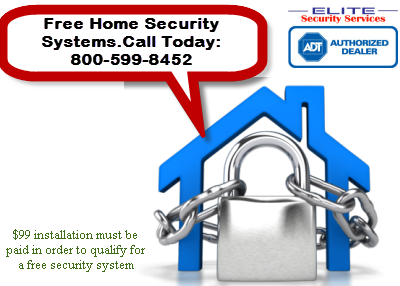 The basic home security systems package from Elite Security Services is capable of transmission of signals to ADT monitoring stations using standard landline phone connection. The package comprises of the latest sensors, burglar alarm, motion detector, digital keypad, and many more. The buyers of the package receive several freebies from the company from time to time. Talking about this excellent plan, Elite Security Services' owner Mr. Paul Shakuri said, "The best thing about this package is that it offers a darn cheap price without compromising on any of the necessary safety features". It must be mentioned here that Mr. Shakuri is an experienced security consultant, too. Apart from the basic package, Elite Security Services has two more high performance home security systems named the elite package and premium package. These two are also not far behind the basic package in terms of success in the market. Elite Security Services has now progressed beyond the larger cities to provide service in the smaller towns and rural areas. Melissa, one their many customers, recently said, "I am really happy with the service I received from Elite Security Services. I could not have asked for more from an inexpensive security package". About the Company: Elite Security Services is a rapidly growing company in the home security industry. They offer highly efficient and economical home security solutions in America and Canada.